Lupine flowers bloom in the wild, but they are not wild natives. They were brought to New Zealand by settlers. This entry could also be filed as one of my “visual viewpoints” you may have seen in earlier posts. 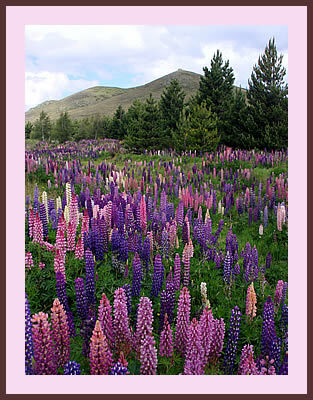 Driving along the hills and mountains of New Zealand, I was impressed with all the beautiful lupine in bloom. What a lovely thing to have wild flowers so profusely scattered all over the hills and fields. Then I found out that they aren’t native to the country at all. Early settlers brought seeds from their gardens and tried to replicate what they had back home. Then the flowers spread, including places where they weren’t wanted.